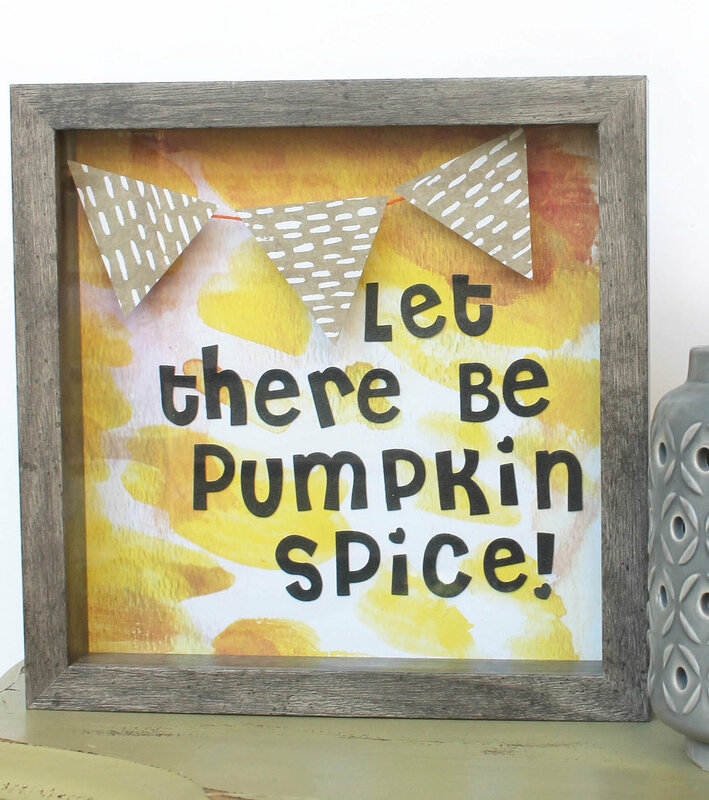 Fall is in full swing and one of our favorite things to do each season is craft up cute decor pieces that can be saved throughout the years! 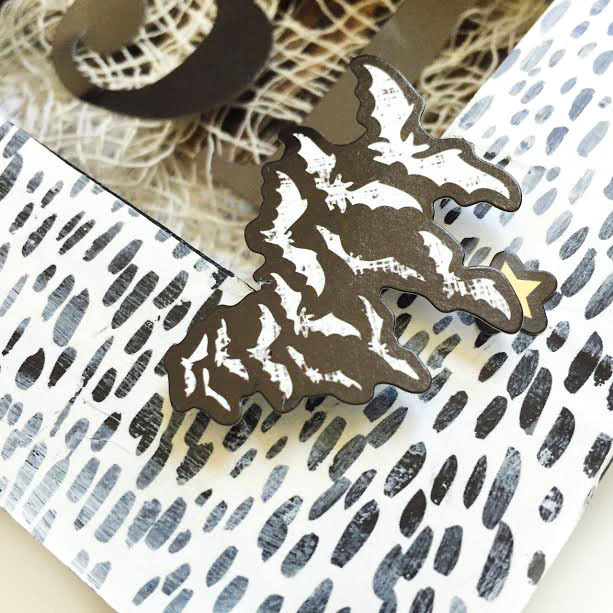 Today we're sharing some DIY fall decor pieces made by mambi Design team member Megan McKenna (IG | blog) that she created using our water transfer paper kit. "I made a wooden plaque that I picked up from Michael's and used the water transfer paper to create a really fun fall decor item for our home. I actually made this just in time and gave it to Brian for Sweetest Day! He loved it!! Here's a hint: men love wood projects so making a gift for him with photos and anything wooden, you're golden! Christmas is coming by the way, if you weren't aware. Haa haa!" "The first thing I did was printed a photo of us on to the paper itself using my ink jet printer. I also wanted to create cute little pumpkins with sayings on them too! So once I chose everything I was printing, I printed it out, set it aside for about 30 minutes to fully dry. This is help the photo not bleed when you put it in water." "Once you're ready for the water step, cut out your photos and fill up a pan or bowl with about an inch or two with water. Place your paper into the water but it is going to start to bubble up on you so make sure you keep it submerged for at least 60 seconds. You will then start to feel the photo peel apart from the backing, somewhat like a temporary tattoo. Then very carefully, take the photo out of the water and stick it to your surface." "If you want a gloss or matte finish to your project, you can paint a coat of Mod Podge over it but wait to do this step after the water transfer paper is completely dry. I added a "forever and ever" gold sticker from the 'Our Big Day' golden sticker pack to the bottom to add that last final touch. I really love how this turned out and I feel its so neutral that we can even keep this up all year round!" 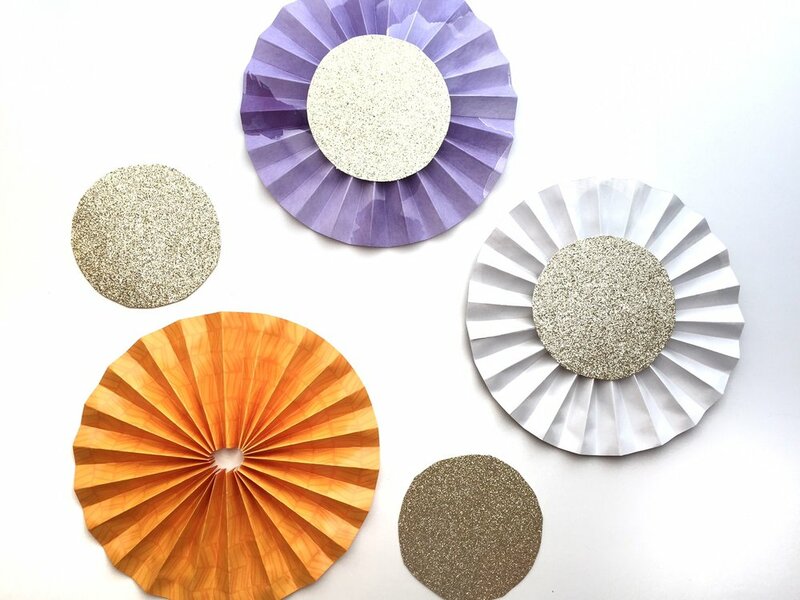 Our 'Fall Leaves' die cuts, with their different leaf shapes in various autumn colors & some with glitter, are always a favorite product to craft with this time of year. Yesterday we shared a DIY fall leaf bookmark for The Happy Planner™, and today we're sharing two home decor projects using these fun Fall leaves! Design Team member Mariel Reyes (IG | blog) created a 'Grateful' Shadowbox using our new rose gold alphas & a sheet from our Rose Gold mambiSHEETS paper pad, and used the leaf die cuts for her children to write what they're grateful for. Meanwhile, mambi Design Team member Michelle Weissert (IG | blog) used the leaf die cuts to make the most perfect fall wreath. "I wanted to create a simple project that the kids could be involved with and also allow them to take time to reflect on all the wonderful reasons they have to be grateful and happy. I love the idea of a gratitude tree, but that didn't reflect my decor or style. I decided to make a shadow box that would not only be pretty fall decor, but functional for collecting the kids thoughts and ideas! I love the new mambiSHEETS w/ the Rose Gold accents. These pages were perfect for the look I wanted. I think the hardest part of the project was deciding which one to use! The gratitude box sits on top of the hall entry table where the kids can take a leaf, write their thoughts, and drop it in. Once complete, we plan on taking out the leaves and reading and sharing our thankfulness! I will store the leaves in Happy Planner™ page protectors to add to my memory keeping planner and we can use the box again next year." "While I wish I had a wreath for every season on my front door, it's just not always happening for me. But for fall, it's a necessity! Since I tend to go overboard for Christmas, I wanted a project that wasn't going to break the bank since it's SERIOUS budget time for us. This project was well under $10 for a simple and beautiful wreath and it could easily be personalized with a bow or wood letter for your family's last name. And the best part, it's SUPER easy! It will take you 30-45 minutes, tops!" "I used a 18-inch grapevine wreath ($4.99) that I purchased from Michael's and two packs of mambi 'Fall Leaves' die cuts ($1.99). You could use just one pack, but I needed more of the larger diecuts, so I broke into the second pack for that and I still have a lot leftover. When I did the first part of the wreath, I laid down a bunch of leaves and arranged them first before I used my hot glue gun to attach them. I curled the leaves up just a little bit to mimic that natural leaves aren't stiff & flat. When I turned it around to do the other side, I glued down the larger leaves first and arranged the smaller ones with it. You could really glue them any way you want to; there's no wrong way. And that's it! Add some ribbon or other embellishments if you like, but I was pretty happy with the simplicity of using just the diecuts. Obviously, this won't be great outdoors if it's exposed to the weather, but because I live in an apartment building I can hang it outside. I totally thought of leaving in on my craft room door though!" For more November or Thanksgiving ideas, head over to our Thanksgiving gallery page. Full force fall - that's where we are in the year - and mambi Design Team member Liz Nielson (IG | blog) wanted a way to always have a bit of fall in her Happy Planner™, but also wanted it to be moveable from week to week during the fall season. So when Liz came across the mambi fall leaf die cuts, with the varying shapes, sizes, and colors, she knew I could create a 'falling leaves' bookmark to represent the slow change in color of the leaves. "I didn't want anything to detract from the leaves themselves, so I used a piece of thin acetate (.003 mm) that I trimmed down to 8" by 1 3/4". This would make it easy to snap in and out of my Happy Planner™. And because the acetate is clear, it disappears and all you see are the leaves." "Since I was trying to mimic the look of leaves falling, I wanted to make sure I alternated the plain colored leaves with the glittered leaves. I also tried to vary the shapes and sizes of the leaves themselves. Take care to also change the direction of leaves periodically, too. Once I was happy with the pattern of my leaves, I used a permanent glue roller to apply glue to the back of each leaf making sure to not cover the punch area or the part of the leaf that would go past the acetate strip. After all of the leaves are applied to the strip, I went back with Aleene's Clear Tacky Glue and applied small dabs of glue between some of the leaves that needed additional glue or support. Let dry overnight, pop in your Happy Planner™, and enjoy!!!" Shop supplies Liz used by clicking on the items below. Creating & sharing seasonal, festive crafts for each holiday is OUR JAM and one of our favorites is right around the corner. Enter: today's project! After putting up all of her Halloween decorations, mambi Design Team member Megan McKenna decided that a DIY banner needed to be added to her collection. 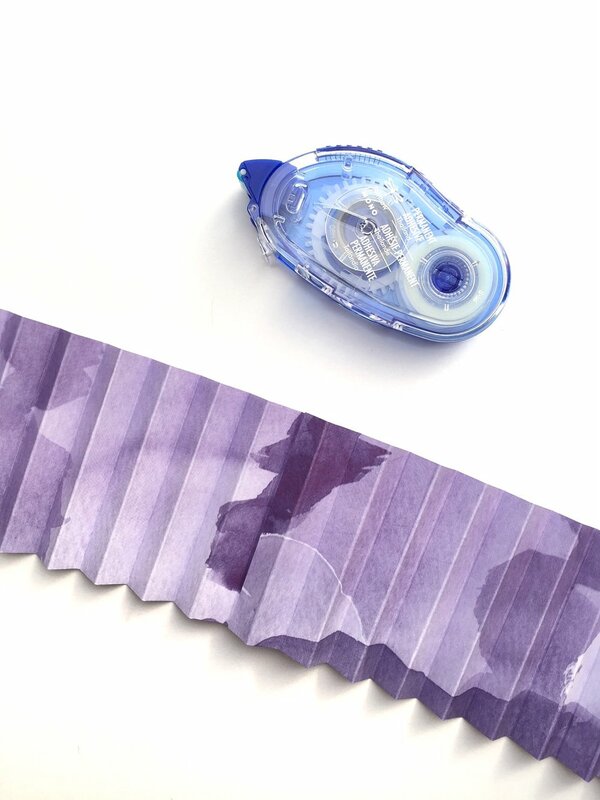 "I used papers from a couple different Expandable Paper Pads and also the purple marble paper is from the 'Modern Marble' mambiSHEETS paper pad. I wanted to go with a color scheme of orange, purple, black and whites. My process was simple. From each paper design I cut two strips that were 3 X 12 inches. I wanted to spell out the word 'SPOOKY' so I needed 6 different patterns (one for each letter). Once I had them ready, I used a score board to make the folds in each strip. NOTE: you don't have to use a score board for this step, you can definitely do this without one but it does make it easier to make everything line up perfectly. I scored on the decorative side on every inch and then flipped it over. Then I scored in between on every half inch. By flipping it over and doing this it will be easier to accordion it up later." "Once you have scored both pieces, use an adhesive to attach the beginning and end together. This will look sort of like a lamp shade! Gently push down and you will see your rosette start to form! I cut out circles from thick glitter paper and I adhered one on the front and one on the back. This will help the rosette keep its form because it will want to bubble up on you. I found it best to use a hot glue gun to do this step because my tape runner just didn't have enough stickiness. Then I used alpha letters from the 'Chalk Whitecaps' mambiSTICKS pack and spelt out 'SPOOKY'. I absolutely LOVE this sticker font for Halloween crafts! Once I figured out what order I wanted each color, I placed the letter stickers on. I used a small nail to poke two holes on the top parts of the rosettes so I could string my twine through them." "...and that is it! I am so in love with this banner and am excited I have this to hang up every year! Say 'Hi!' to my dog, Zoey, who got in the way when I tried to snap a photo of the finished product! Haa haa!" The phrase commonly used today is 'pumpkin spice everything,' but for us, a twist can be applied for it to say 'pumpkin craft everything'. 'Tis the season of pumpkins, and we are adoring the way mambi Design Team member Erica Canant (IG | blog) used mambiSHEETS to decoupage cardboard pumpkins for her outdoor autumn display. "Every fall, I love to make some sort of fall display outside our door. Fall is definitely my favorite season and it's my second favorite time of the year to decorate (sorry, can't beat Christmas time for me). As I walked the aisles of Hobby Lobby one day with my mom (like we do at least once a week), I came across these adorable Papier-mâché pumpkins. Once I saw those cute little guys, I knew I wanted to decoupage them using mambiSHEETS and use them in my fall display!" I cut strips and decoupage'd away! For the stem of the pumpkins, I used some gold washi. Really, any of the mambi washi would make the stems pop! And voilà - cute and unique pumpkins for your fall display! And although I didn't do this project with my little ones (they're toddlers and modpodge just didn't seem like a good idea), this would be a great project to do with your older kiddos during this fun fall and Halloween season!" The members of our Design Team love finding ways to switch up their home decor throughout the year, and today we're sharing how members Jen Randall and Katie Barton both created their own version of a seasonal shadow box for Fall.
" I love making DIY decor projects for various holidays. Halloween can be a bit tricky because I don't want to make anything too scary for my kids. I love that the Happy Halloween set of mambiSTICKS is perfectly spooky without being too scary." 1) Find a wood frame that you like. Jen used an inexpensive wood frame from Michaels. 2) Paint the frame black and set it aside to dry. 3) While the frame dries, remove the 4x4 piece from the center and cover it with a Halloween inspired print from the Expandable Paper Pads. I used Mod Podge to glue the paper. 5) Now, take the center piece and create away! Layer some cardboard (painted black), Creepy Cloth (that's what the package said! It's just spider web like cloth found in the Halloween decorations aisle) and some fabulous large mambiSTICKS Black Alphas. When you are ready glue it all down. 6) Add some gesso or white paint around the outside of the frame to age it a bit. "I was recently inspired to put a seasonal shadowbox on display to make seasonal decorating even easier. Instead of dragging a box of holiday decorations out of storage each season, I'll be able to quickly update my shadowbox with supplies from my craft stash. I'll likely keep my shadowbox displays on the simple side, so I don't feel guilty to change them often. I already have so many fun ideas; I'm going to need to update it a couple times a month if I want to fit them all in!" "For my fall display, I used mambi ALPHAchips to add a fun seasonal phrase atop the mambiSHEETS. 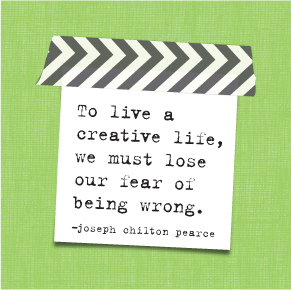 I used a coordinating mambiSHEETS pattern to create a triangle banner to add dimension." We are no strangers to pumpkin crafts, and today we're sharing our latest pumpkin project by new mambi Design Team member Nicole Patterson (blog | IG) that she created for Breast Cancer Awareness using one of our soft spoken™ packs. "October also means it's Breast Cancer Awareness Month. Every year, a few ladies I know put on an event to help benefit breast cancer awareness and every year, I'm responsible for the party decor. I love participating in this event to bring awareness to breast cancer, so for this project, I wanted to combine my love for Fall and my need to represent Breast Cancer Awareness, so pink pumpkins it was!" • Spray paint the pumpkins pink and allowing them to dry. • Place the Breast Cancer SOFT SPOKEN™ stickers on the front of the pumpkin. • Top it off with a bow. The mambi team will be at Pinners Conference, Arizona this weekend, and you can follow along on our adventures on Instagram at @the_happy_planner! HELLO! Do all the things. 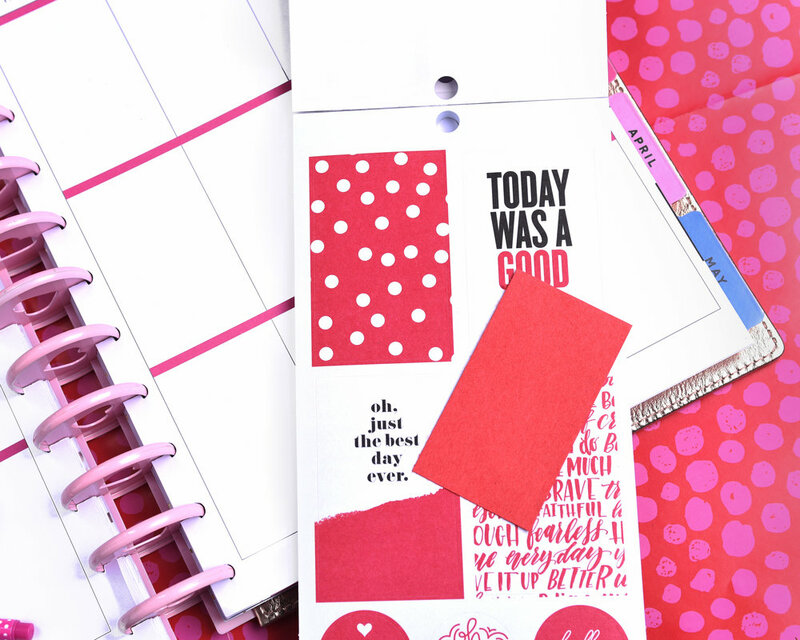 ...like upcycle the box our Happy Planner™ DELUXE COVER comes in! Today we're sharing how new mambi Design Team member Liz Nielson (blog | IG) used pre-pasted mambiSHEETS, some Happy Planner™ washi, and mambi stickers to create this DIY storage for her POCKET PAGES™ cards. "My inspiration came from my need for an alternative storage solution for my POCKET PAGES™ cards since my current storage for them wasn't working. I discovered that the 3X4 cards fit perfectly with three rows across in the box. So that it looked liked the box was made for the cards, I decided that since using the prepasted mambiSHEETS™ on my set of drawers was so easy that they would be perfect to use here." "Using my ruler with a pencil to mark, I measured the front/back, sides, and bottom. To have a few seams as possible but still keep it manageable, I added the measurements of one side and one front/back to make two strips. But you could also leave each side and front/back as it's own piece (giving you 5 cut pieces vs. 3) if that is more comfortable for you. Before cutting I added an additional 1/4" to all sides of both strips to ensure that they will overlap and completely cover the box. With the measurement for the bottom of the box, you'll want to subtract a 1/4". This will create a cleaner finish for the bottom of the box. To eliminate the pencil marks, gently erase them. Remember for all you measurements and cuts to 'measure twice and cut once'. You'll save yourself a lot of frustration and headaches. Once everything is cut and your spray bottle is filled, you're ready to upcycle! Starting with one of the front/side pieces spray the back of the prepasted mambiSHEETS™ evenly and carefully align with the top edge of the box. Smooth with your hand (or optional brayer) to ensure even adhesion to the box and push out any excess water. If you find that it's not quite sticking at first, this is when you can apply some warm air via your heat tool/hair dryer to speed the drying process a bit. Don't completely adhere the edges just yet as that will be done in the next step. At the corners, make a small straight cut 1/4" in. Then cut two, small triangle pieces on each side of the cut making a 'v' shape. This is also called a miter cut. If the loose edges are dry, you can spray some water on your finger tips to reactivate the adhesive on the back. Then slowly press down all edges and again use your heat tool, if necessary. Let dry completely. Then you can leave it just like that or feel free to add any embellishments you choose. I chose a coordinating color of Happy Planner™ washi tape to edge with - again making sure to miter the corners. I also added a three-dimensional SOFT SPOKEN™ 'Hello' sticker and a 'do all the things' sticker from The Happy Planner™ TODAY IS THE DAY value sticker pack. Now you're ready to fill it with your POCKET PAGES™ cards or even a special place to keep your Happy Planner™! Enjoy your new upcycled POCKET PAGES™ card storage!" Our pre-pasted mambiSHEETS are now available at Michaels. on the mambiSHOP 10/31 @ 8am PST. released in the 10/31 set on our Periscope.